As the BRICS Summit completes 10 years, it is time to look back at the impact, economic clout and the political heft that the group has gained in the last 10 years while looking at ways to consolidate it. It is said that in any meeting of powerful leaders, what is left unsaid is normally more important than what is spoken. Such high-profile meetings generally have a set protocol and most world leaders prefer to play their cards close to their chest. In fact, a lot more serious business happens behind closed doors when leaders meet one-to-one as opposed to grandiose events. Of course, we can never get the full picture of what goes on behind the screen. However, what each leader deliberately leaves unsaid gives one a good idea behind his/her intent in the larger scheme of things. Cyril Ramaphosa of South Africa – What he committed and what he ignored? The very fact that Cyril Ramaphosa has extended a State Visit invitation to Chinese President Xi Jinping, but not to Putin and Modi clearly indicates the way South Africa is veering towards. In fact, Ramaphosa, during the BRICS meet, conveyed to Russia their intent of not going ahead with the nuclear deal. The nuclear deal was signed between Russian President Vladimir Putin and former South African President Jacob Zuma, but Ramaphosa obviously wants a more diversified energy mix. The South African economy is stagnating and its GDP is unlikely to expand in a big way going forth. For now, South Africa appears to be riding the Chinese bandwagon and does not intend to dismount any time soon. While Ramaphosa has spoken extensively about a larger BRICS cooperation, it is quite clear that South Africa will prefer the Chinese leadership for now. Xi Jinping, perhaps, came to Africa with a huge advantage. With China offering a blank checkbook plus a virtually captive market for all minerals from Africa, Xi’s hold was almost unassailable. His problems were elsewhere and that was apparent in his speech. Xi’s problem is the trade war. Judging from the way he ranted against American unilateralism, it was clear that Trump had surely hit China where it hurts. Trump realizes that with the US running a trade deficit of $376bn with China, they are fighting a battle where Trump can certainly outlast Xi. And that desperation was evident in the manner in which Xi called upon the BRICS nations to rise against the US. Xi, perhaps, realizes that closer cooperation within the BRICS is not possible if there is a trust deficit with India. Surprisingly, there was little mention of counter-terrorism or the commitment to curb terrorist groups in neighboring Pakistan. Xi’s silence on these matters makes it clear that China does not desire to compromise on its expansionist aspirations, either in the South China Sea or via the Belt and Road Initiative (BRI). Modi’s eight-minute speech was almost entirely devoted to being eloquent about the “Fourth Industrial Revolution”. 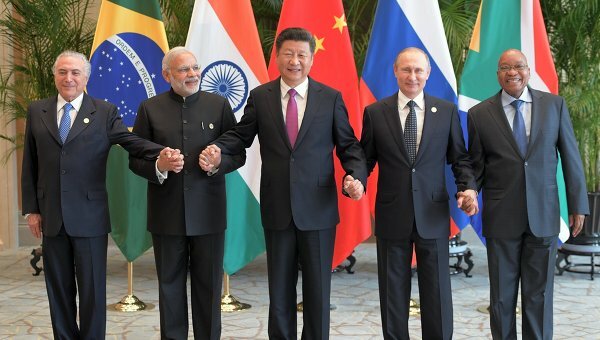 Modi’s point was that the BRICS had missed the earlier industrial revolutions and could not afford to miss the fourth revolution that is being driven by big data, artificial intelligence, machine learning, robotics, and digital platforms. Modi realizes that with services accounting for over 60% of India’s GDP, the country stands the best chance of leveraging on this industrial revolution 4.0. Not surprisingly, his entire speech was focused on the nuances of the new idea and the urgent need for re-skilling in a dynamic world. But what Modi left unsaid was more critical. There was virtually no mention about the trade war, making it clear that while he was all for free trade, he would do little in the trade war between the US and China. At least, the message to Xi was that he could expect little cooperation from India unless there was tangible evidence of China respecting India’s sovereignty and its borders. That message, though unsaid, was heard loud and clear. While Putin did pay lip service to the trade war and the need for free trade, Russia did not seem overly worried about the United States’ trade war. Putin significantly spoke about expanding the BRICS Bank’s presence well beyond China, obviously seeking to limit Chinese influence in the group. Putin realizes that two of the BRICS economies (Brazil and South Africa) are overly dependent on China’s gluttonous appetite for resources. Chinese demand and Chinese investments will continue to be the primary drivers for Brazil and South Africa in the foreseeable future. Putin has subtly hinted at India and Russia acting as a counterweight to Chinese influence. Putin obviously had a much bigger agenda as well. The recent US sanctions have made Russia almost a pariah in the US and across most of Europe. Putin is obviously looking at a powerful bloc with whom he can share warm relations. The BRICS offers him exactly that. Putin would be more interested in finding buyers for his two principal exports, viz. energy and arms, and that has been a disappointment for Putin at the BRICS summit. Meanwhile, Brazilian President Michel Temer has enough problems of his own, including weak commodity prices, US trade tariffs, and rising inflation, among others, to deal with. His primary focus would be to consolidate the national economy and get guarantees on trade from large economies, especially China. As the BRICS Summit completes 10 years, it is time to look back at the impact, economic clout and the political heft that the group has gained in the last 10 years while looking at ways to consolidate it. That could be the agenda for the next decade of BRICS!